Baahubali 2 Pre Release Event Live: Watch Baahubali 2 Audio launch Function 360 degree, Full Songs Jukebox. Baahubali is a two part Indian movie that is simultaneously being shot in Telugu and Tamil. The film will also be dubbed in Hindi, Malayalam and in several other foreign languages. On 16th March the trailer of Baahubali 2 was released and turned the attention of audience enormously. The Baahubali 2 trailer has scored 1 million views in just one hour and turned the attention of all audience. Now another surprise is ready for audience and fans. The most awaited of Baahubali 2 audio launch function is announced. Reportedly the Baahubali 2 Pre Release Event Live is scheduled to held at Ramoji Film City on 26th March 2017 at 5.00 PM. We all can enjoy the marvellous music of Baahubali Part 2. Music Director MM Keervani has given the fabulous music for the successor film Baahubali. Now the music is going to be next level to the Bahubali – The Beginning. Audience are desperately waiting for this news regarding the Baahubali 2 Pre Release Event. The surprising news was at last revealed by the makers officially, they have fixed the audio launch date as 26th March. The Baahubali 2 audio release event will be held grandly at Ramoji film city. Many of the film industry heads are expected to attend the Baahubali 2 Pre Release function. From the nearby sources it was known that Telangana CM KCR and IT Minister KTR were invited as chief guests for this event. Tamannaah as Avanthika with Ramya Krishna, Nasser, Sathyaraj, Kiccha Sudeepa, Adivi Sesh, Rakesh Varre, Meka Ramakrishna. Excited about the #Baahubali2PreReleaseEvent today? Here’s where you can catch all the action, LIVE! SS Rajamouli’s Baahibali The beginning is turned up as the most scenic wonder. Now, in the trailer of Baahubali 2 the visual effects are mesmerising the audience with rich work and solid presentation. The background music also caused for goose bumps for sure. The trailer enormously grabbed the attention from world class audience. It created record by scoring 50 million vies in just 24 hours. 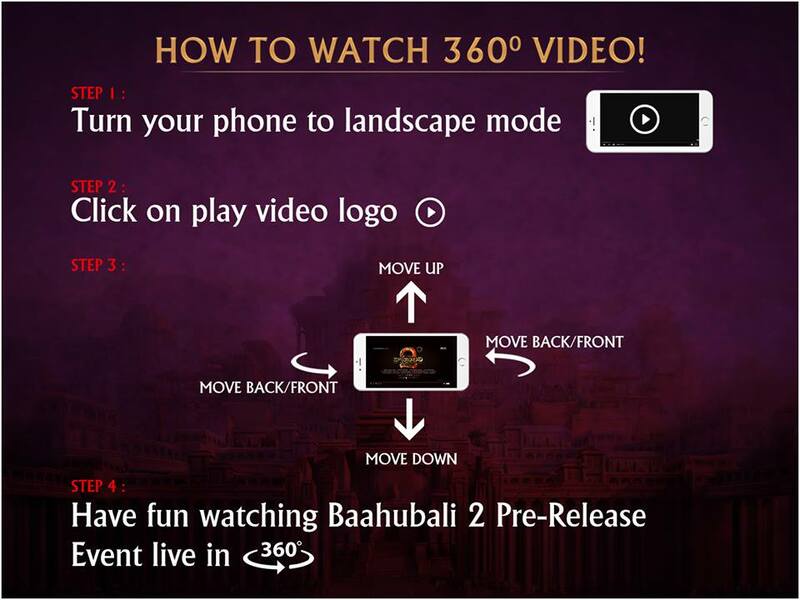 How to watch Baahubali 2 Audio launch Function 360 degree? HTC VIVE and Oculus Rift users can experience the 360 video with the Steam application “Virtual Desktop”. 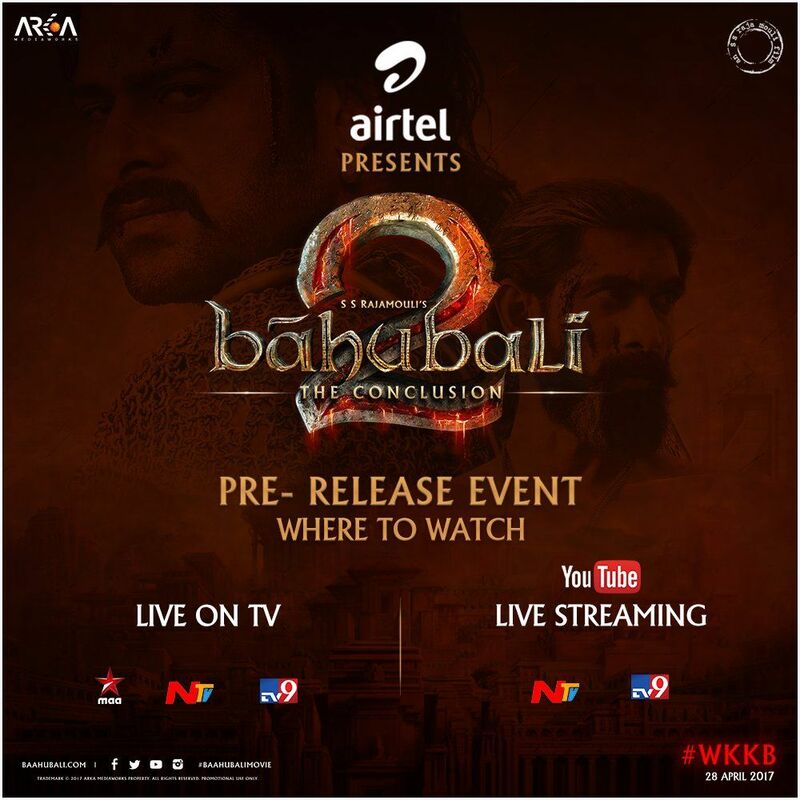 Once in the app, users can access the Pre Release Event at YouTube.com/BaahubaliOfficial. Next is Baahubali 2 audio turn. We ll must get ready to involve in the world of music of Baahubali 2. The expectations are rising day by day on this film. Prabhas, Rana, Anushka, Tamanna, Ramya Krishna, Sathya Raj starrer Baahubali 2 is one of the most awaited films of the year. The movie has already scheduled to release on 28th April across the Globe. Stay tuned to amaze yourself by watching the visual wonder.